He was in Bradford for a “young people’s educational awards ceremony”. It was, according to Takki Sulaiman’s press office, a “longstanding commitment”. But it actually took place on Saturday lunchtime: there are tweets from the event timed at 2pm that day. Bradford is less than a four hour drive away from Tower Hamlets. I presume he stayed overnight in Bradford on Saturday rather than returning. It’s his call, of course, but he does invite some pretty justifiable criticism with decisions like this. The awards at the Shapla Community Hall were hosted by a Bangladeshi organisation called BEAP (Bangladesh Education Achievement Project). From the video it seemed a reasonably small event, but clearly Lutfur is something of community leader in the wider Bengali community and not just east London. His audience would have been grateful for his attendance. The video below is fascinating. George Galloway is the warm-up act for the Tower Hamlets mayor and makes a speech defending him as some kind of ex-Labour/real Labour blood brother. And at 7.20mins, you can see Lutfur arriving with his kitchen cabinet from Tower Hamlets, ie Cllr Gulam Robbani, Cllr Aminur Khan (Rabina Khan’s husband) and Cllr Maium Miah. If there are others, I’ve missed please let me know. You then see Galloway embracing Lutfur. It seems Lutfur isn’t that bothered by Galloway, that he’s somewhat embarrassed by him. 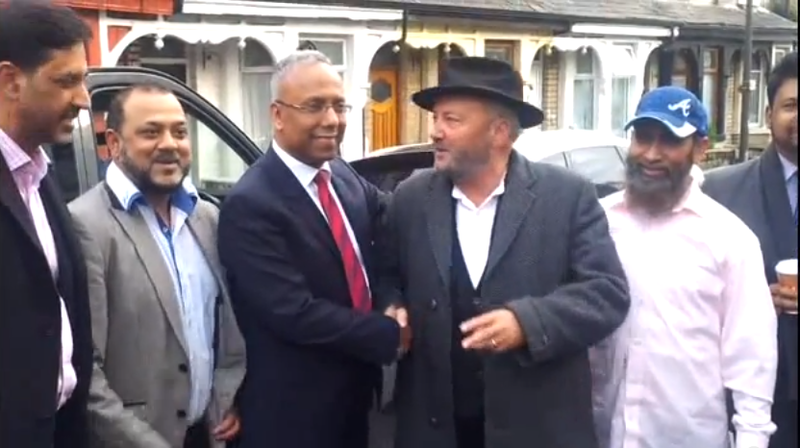 They spend a few seconds posing for the cameras and Lutfur barely looks Galloway in the eye as George fawns over him. I was half-excpecting George to lap up some imaginary Lutfur milk. It seems Galloway is now desperate for Lutfur’s approval. Is it Lutfur who has now become the Real Deal? Mayor Lutfur and me and Ken Livingstone have some things in common. One of them is that we were all expelled from New Labour for standing up for principles and standing up for real Labour values. We all three of us then defeated New Labour in election after election. ..I campaigned for a directly elected mayor in Tower Hamlets. We started the petition that created this position and I was proud to work with Mayor Lutfur in both of his successful elections. We should be proud of his victories and his mayoralty in east London. I wish we in Bradford had a council like Lutfur Rahman has in Tower Hamlets. What he has now been subjected to is nothing short of a racist attack. They hate Lutfur because he has proved that Bengalis can win elections and can carry out their promises made to the people. During my three years at the East London Advertiser, I spent a fair amount of time with George Galloway’s aides in the Respect party. I’m fairly confident in saying that had the PwC report been written about the Labour administration in Tower Hamlets back then, they’d have milked it for all its worth. They were as scathing about the then council leader in 2008, Lutfur Rahman, as they were about his predecessors, Denise Jones and Michael Keith. In particular, they disliked what they believed to be the whiff of cronyism…in both the awarding of grants and also the appointment of useful mates to political positions. In fact, Respect’s decision to organise successful petition that heralded the directly elected mayoral system in 2009/10 was an attempt to end such a culture, they argued. You’ll probably have heard by now that Secretary of State Eric Pickles has ordered officials in to undermine local democracy in Tower Hamlets, and it’s local residents that are paying for it (sic). You also may have heard that despite Pickles’ decision to send in the attack dogs, the report he ordered found no fraud or corruption in Tower Hamlets. He’s seized on any flimsy excuse he can find to shut down the 37,395 voices that voted for Mayor Lutfur Rahman and for a council that stands up to the cuts and invests in education, affordable homes and our future. This is Pickles versus the people. And it’s up to all of us to stand up to him. Thank you so much for your help. We haven’t got big banks or corporate newspapers on our side, so every little thing you do really does count. The petition they refer to is here, and at the time of writing has 675 votes. Note its name: ‘Respect our democracy and treat councils equally!’ And note the Twitter hashtag supporters are being urged to use: #respectourvotes. The word ‘respect’ is popping up a lot. So of course Galloway won’t lash out at Lutfur for his policy and process failures: they’re merely “flimsy excuses”. Lutfur is now a convenient “Pickles versus the People” general election tool. Convenient for Lutfur, too, of course: posing the bigger question acts as a smokescreen for the criticisms. There’s even some talk among his supporters that Lutfur may call a mayoral by-election to re-establish his authority. I’m not convinced he would press that nuclear button and in any case, I’m not sure when he would press it. The Election Court hearing is due to start in mid-late January and it could last until March. Even then, the verdict may be reserved for some weeks. If he emerges from that victorious, I’m not sure why he’d want or need to hold a by-election (although he could emerge victorious but tainted and damaged). Who knows what his priorities are. Certainly, he didn’t prioritise Remembrance Sunday again this year. He was again a no-show at the wreath-laying ceremony at Tower Hill on Sunday, when there were huge crowds in the area observing the ceramic poppy display in the Tower of London moat across the road. Lutfur’s reserved seat next to the Deputy Lord Lieutenant of London, Commander John Ludgate, remained empty. The Mayor was regrettably unable to attend the Merchant Navy Memorial Service on Sunday due to a long-standing commitment to attend an (sic) young people’s education awards ceremony outside London. In his absence the Mayor asked Mickey Ambrose, former footballer and Duke of Edinburgh Awards ambassador to represent him and lay a wreath on his behalf. ‪The Mayor attended a Remembrance Service on Friday at City Hall with other Mayors and Council leaders, and is looking forward to the Armistice Day event on Tuesday at the Town Hall. The Mayor will also host a reception for war veterans after the event. 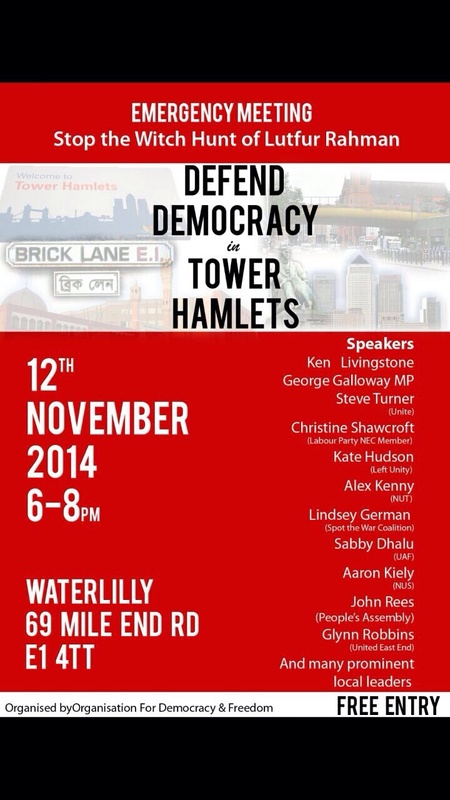 Mickey Ambrose stood and lost as a Tower Hamlets First candidate in Bow East in May. Quite why Lutfur asked him to deputise and not any of his elected councillors is a mystery. I also asked the council what this longstanding awards ceremony commitment was, when it actually took place and where it was held. 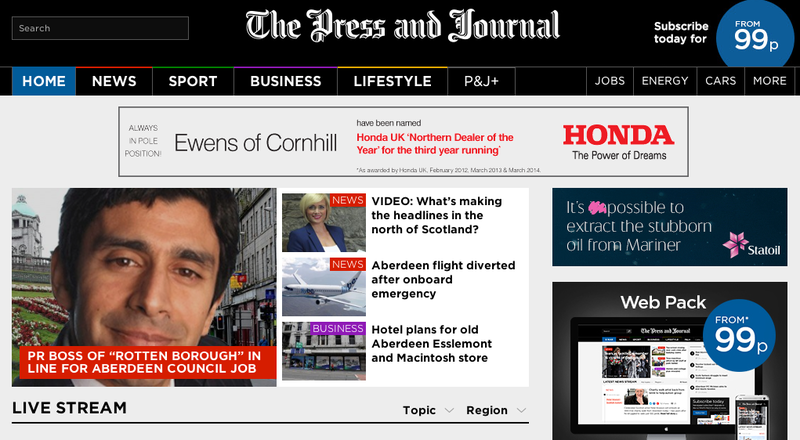 Takki Sulaiman to boost regional newspaper journalism in Scotland? And so the creatures begin to leave the ship. Council leaders in Aberdeen last night revealed that a PR chief at a “rotten borough” English authority is the man they want to transform the city’s public image – even though he has yet to accept their £80,000-a-year job offer. Takki Sulaiman is currently employed at Tower Hamlets in East London, which has been at the centre of “cronyism and corruption” allegations in recent weeks. Aberdeen’s deputy council leader Marie Boulton confirmed that Mr Sulaiman, a former Labour councillor, is the preferred candidate to take on a new head of communications and promotion job in the granite city. The role was created as part of a restructuring of the council, but prompted complaints from opposition members who argued the money could be better spent elsewhere. Senior members of the Labour-led administration argued that the appointment would help boost the outward perception of an authority which has been dogged by controversy in recent years. A divisive battle over the future of Union Terrace Gardens was followed by an attempt to ban First Minister Alex Salmond from all council property in the city. Criticism has also been levelled at the leadership over the £107million Marischal Square revamp of the former council headquarters. Mrs Boulton, who convened an appointments panel to fill the post, said she was “hopeful” that Mr Sulaiman would accept the job, but played down the media storm surrounding the London borough council. She said: “We went through a rigorous interview process, we had stakeholder groups involved throughout, the corporate management team interviewed him and he came in front of elected members and the chief executive. All of the groups recognised that he was the preferred candidate. “We are aware of the criticism that has been levelled at Tower Hamlets, but based on the conversations we had with the chief executive, she was confident and happy to proceed. Mr Sulaiman, who is understood to be earning about £98,000-a-year in his current role, has not yet accepted the job and did not respond to inquiries from the Press and Journal yesterday. Mrs Boulton pointed out that he had impressed panel members with his experience during the London Olympics and the regeneration of the Tower Hamlets area as a result. Labour group secretary Willie Young said he was unaware that the top candidate for the new post was a former Labour councillor for Haringey. He said: “That never even came into it. This was a guy who we were looking at purely on an employment basis, and he came across as by far the best candidate. However, Callum McCaig, leader of the opposition SNP group, said: “The very fact that this person who has been offered this spin doctor position at Aberdeen City Council is coming from somewhere branded as a rotten borough begs the question of who in their right mind thinks that this is a good idea. Aberdeen City Council’s media team did not respond to a request for comment last night. Journalists and SNP members in Aberdeen can research some of Takki’s record here. I was told on the night of the Tower Hamlets election count in May that Takki was looking for a new job, so his job search seems to have been going on for a good six months. He may be many things but he’s not that stupid (although his refusal to engage with critical elements of the press has been dumb): he can see which way the wind is blowing. Eric Pickles is on a war footing with East End Life, which Takki oversees as head of communications. It’s almost certain the DCLG Commissioners will also take some control of Takki’s department when it comes to council publicity planning. If he didn’t think his position was actually under threat, he’ll know it’s going to become less enjoyable. But if he does leave, this might be a good chance to start the much-needed renewal of the borough’s reputation. Slashing the role’s £98k salary would be a first step. Anyone tempted by the role?